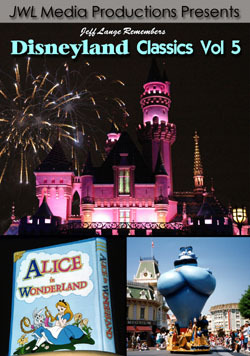 New Fantasyland opened for previews last Friday! We had known about the upcoming preview for days, but we were in Pittsburgh until Saturday – we are very happy that our friends Daniel and Corinne Andersson shot footage for us! 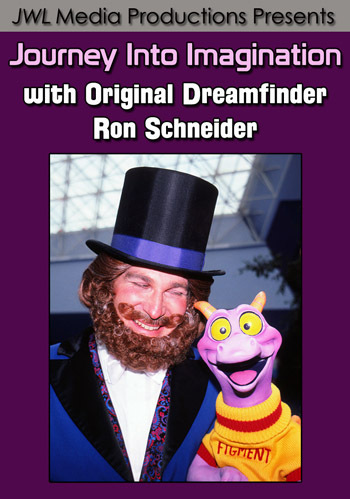 You can see the video below the photos, they were the very first guests in line, and the very first guests to enter New Fantasyland. 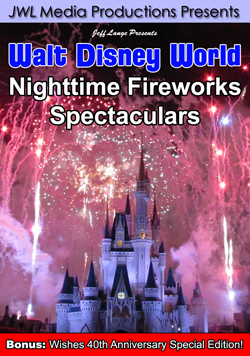 We did make it into this area after the Swan & Dolphin Food & Wine Classic on Saturday – tired from our flight, but excited to see the expansion for ourselves. I think we’ve been there 4 times now! 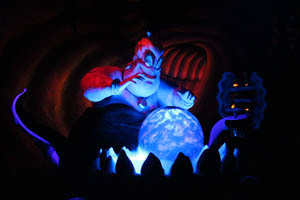 We never waited long for Under the Sea – Journey of the Little Mermaid (below, left). 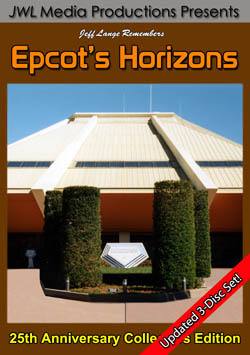 The longest wait was 20 minutes, but it was more often than not that we walked right on. 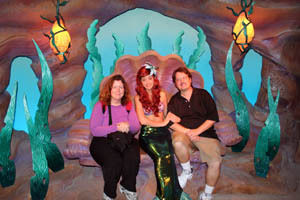 The Mermaid queue is detailed and exquisite, and there is no way to take a bad photo here (below, right). 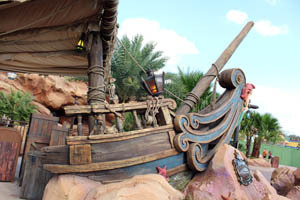 At the entrance, a boat has run aground (below, left). 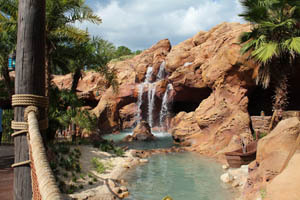 Waterfalls are part of the landscaping in the queue, which is as much an attraction as the ride (below, right). 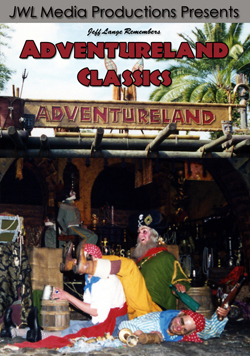 I did notice some of the background music was the same songs that played in the former 20,000 Leagues Under the Sea attraction that was previously located here. 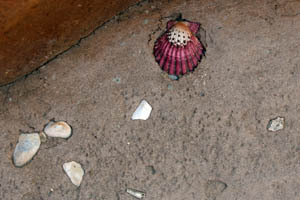 Look down, and you can see beautiful shells in the walkway (below, left). 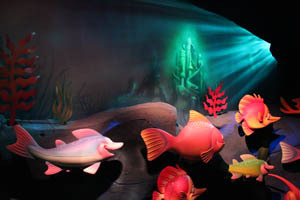 There is a tribute to 20,000 Leagues Under the Sea in the queue (below, right). 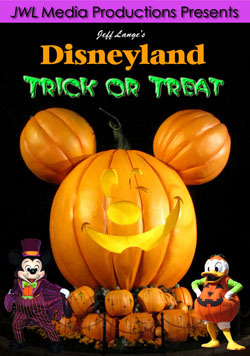 You’ll see it off to the left hand side, by looking down – just before you go inside. 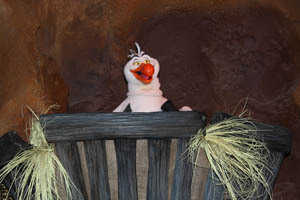 Scuttle is not only in the ride, but he talks in the queue (below, left). 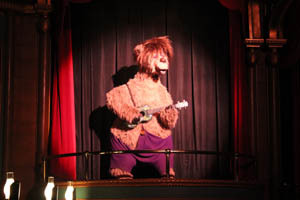 It is a terrific animatronic, it reminds me of Mr. 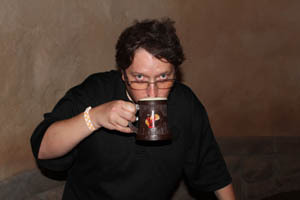 Potato Head in Toy Story Mania – except of course, as Denise says, he isn’t a potato. 🙂 The queue has some interactive elements that didn’t seem to work much while we were there. 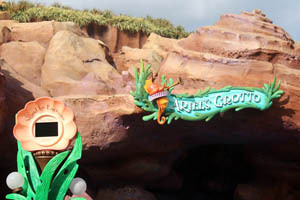 If you read the signs on the way into the queue, you’ll see that this crab is supposed to interact (below, right). 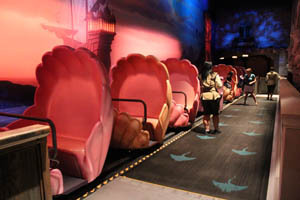 Clam shells make their way to us, so that we can get on the ride (below, left). 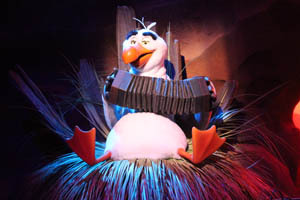 Scuttle sits with his accordion before guests head “under the sea” (below, right). 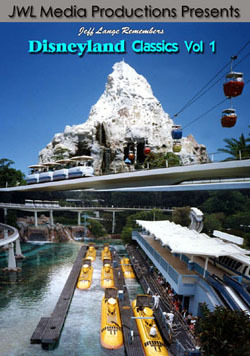 The ride is very similar to the one in California (below, left), with a few small changes. One of the differences is that there is no Mr. Limpet in the Florida version. I also felt like the car movement wasn’t exactly the same. Ariel’s hair (below, right) was changed recently in California, from the ice cream swirl-look to this more natural hairdo that is also in the Fantasyland version (below, right). 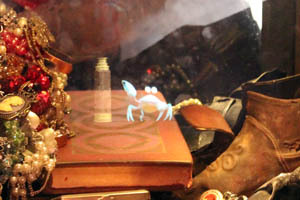 Ursula looks in her crystal ball (below, left), but soon is defeated. 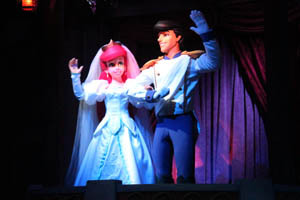 Ariel and Prince Eric (below, right) wave to guests as the clam shells glide by. 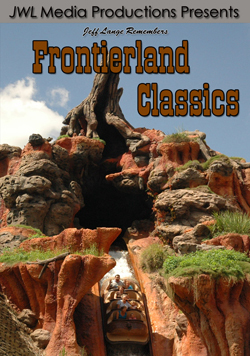 Video #1 – New Fantasyland POV By First Guests Ever to Enter 10/12/12 – Gaston, Imagineers, Mermaid Queue – This video is taken by the very first guests who entered the New Fantasyland on the first preview day, October 12th! Thanks to Daniel and Corinne Andersson for sharing the exciting footage. 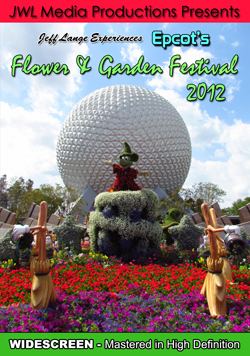 You’ll see the plants rolled away as New Fantasyland opened to guests! Imagineers (some taking photos), Cast Members and Gaston wave as guests walk in, and you can see what it’s like to be the first guests to walk from the entrance and through the queue of Under the Sea, Voyage of the Little Mermaid! 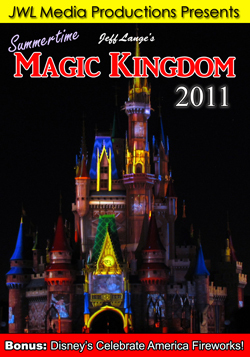 Currently, New Fantasyland is having a “Dress Rehearsal”, but it’s been open for the last few days. 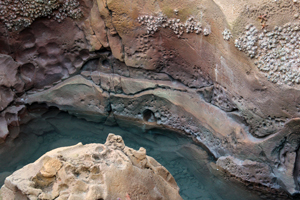 Ariel’s Grotto is also beautifully designed (below, left). 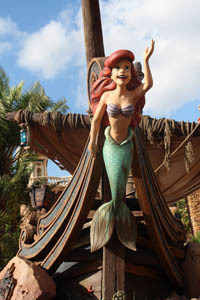 Ariel has her fins in the Grotto (below, right). This photo was taken on the night we arrived back from Pittsburgh – and we’d just been to the Swan & Dolphin Food & Wine Classic. We were both really tired! 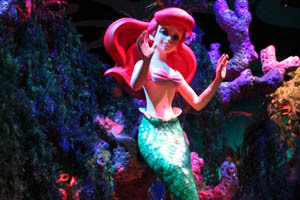 Video #2 – Ariel’s Grotto Meet and Greet Opening Day, New Fantasyland Walt Disney World, Little Mermaid Ariel – Ariel now has her own grotto in New Fantasyland! Our friends Daniel and Corinne Andersson were there to film Ariel’s first day in her new meet-and-greet home (she was quite talkative). 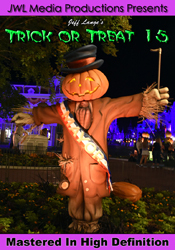 New Fantasyland is having a “Dress Rehearsal”, but it’s been open for the last few days. 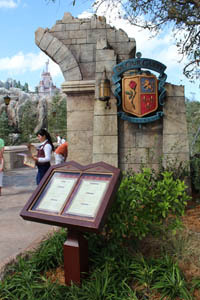 Gaston greeted us in front of his tavern (below, left). 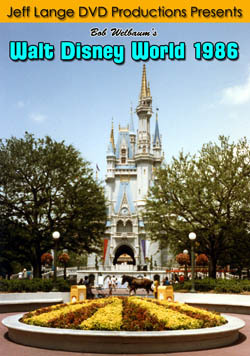 We had discovered the fountain (below, right) a few months back from our visits to the Pooh queue to photograph this area, but now the whole fountain is visible! 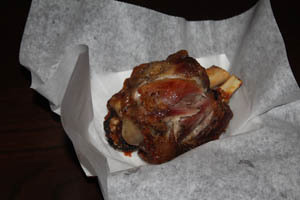 I tried the Roasted Pork Shank at Gaston’s Tavern (below, left). The portion size is small for $7.99, and I’d have liked some sauce – but it did have a good flavor. 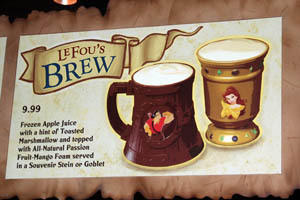 I think I like LeFou’s Brew (below, right) better than Denise does. She loves frozen Butterbeer at Islands of Adventure, but is just so-so on this. 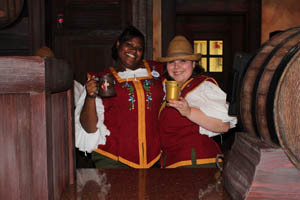 Two Cast Members lift the souvenir cups (below, left) as we ordered a drink. 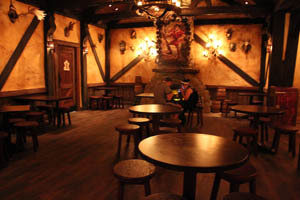 Gaston’s Tavern was never too crowded when we were there, this photo (below, right) was taken later in the evening. 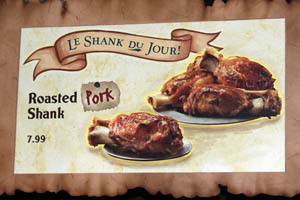 Here is a photo of the Pork Shank (below, left), and my frothy LeFou’s Brew (below, right) in a souvenir cup. 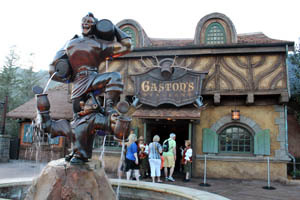 Video #3 – Gaston’s Tavern in New Fantasyland, Gaston Meet & Greet – Magic Kingdom, Walt Disney World – Here is a look at the new Gaston’s Tavern in New Fantasyland at the Magic Kingdom! 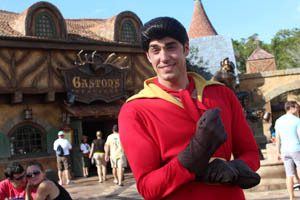 Gaston greets us before we venture inside (he seems to have used antlers in all of his decorating) plus Le Fou’s Brew and more! 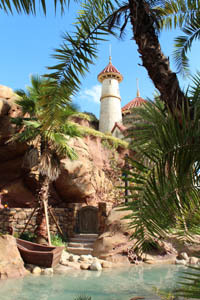 New Fantasyland is having a “Dress Rehearsal”, but it’s been open for the last few days. 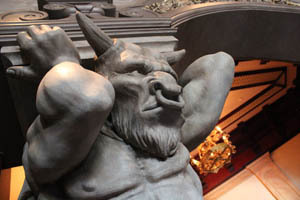 We also had the opportunity – several times – to check out the lobby of Be Our Guest Restaurant (below, left). Again, everything is highly detailed! 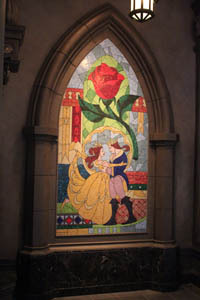 Belle and her prince are featured in this beautiful mosaic inside the lobby (below, right). 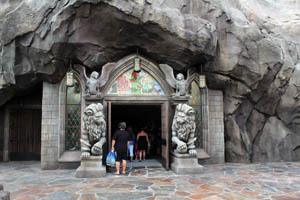 Guests entering Be Our Guest will not only be treated to lavish design outside, but inside as well (below, left). 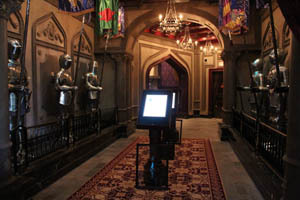 The Mysterious West Wing of Be Our Guest is currently closed to guests (below, right), but you can see the suits of armor lining the walls. 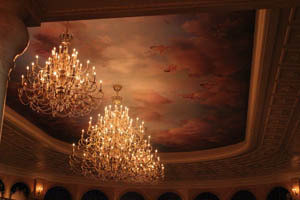 Cherubs grace the ceiling of the ballroom (below, left), which is visible from the lobby. Gently falling snow can be seen outside of the windows (below, right). The meal price here is moderate compared with other sit-down restaurants, we are looking forward to trying it out next month! A couple of months back, we showed you some of the outside of Be Our Guest restaurant. 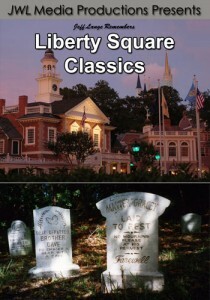 Now we have the full picture (below, left). 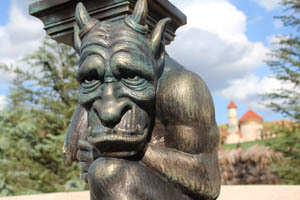 There are so many photo opportunities in New Fantasyland, we love the gargoyles that flank the walkway to Be Our Guest (below, right). 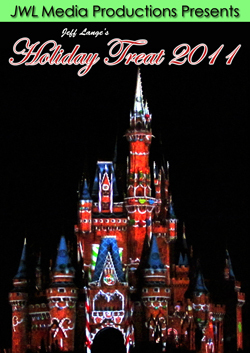 Video #4 – Be Our Guest Restaurant Detailed Tour – Exterior, Lobby, Ballroom – New Fantasyland, Magic Kingdom – Be Our Guest Restaurant is not yet open for full viewing, but the Exterior and Lobby have been available for guests to view during New Fantasyland previews! 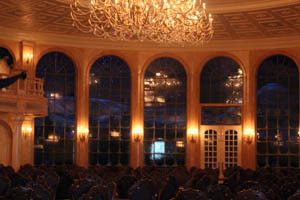 This area also allows for an expansive look into the gorgeous ballroom! 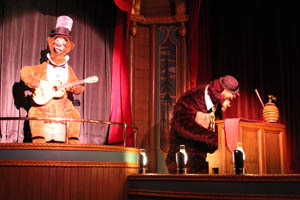 The Country Bear Jamboree closed for refurbishment a couple of months back, and is now re-opened with some major changes (below, left). The sound is great, it’s nice to see the bears get some TLC as well. But, there were some pretty big cuts in the show, including the removal of “Devilish Mary“, check out this clip to see some of the removed bits. Liver Lips McGrowl (below, right) now is sporting some pretty wild hair! The “Little Buford” segment is still in the show (below, left), we were actually not expecting that song to make the cut. Everything does look fresh (below, right), but it was a disappointment to see some jokes and songs removed from the show. 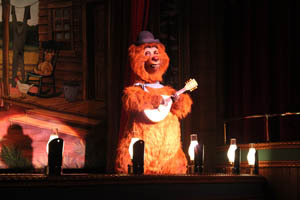 Video #5 – Country Bear Jamboree New Revised Version 10/17/12 Magic Kingdom, Walt Disney World – Today the Country Bear Jamboree at Walt Disney World’s Magic Kingdom reopened after a recent refurbishment. 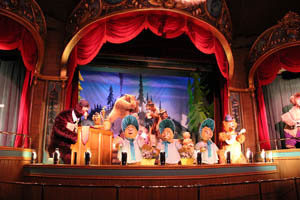 The show was tightened and cut by over 4 minutes, Bears were given new fur and costumes updated. 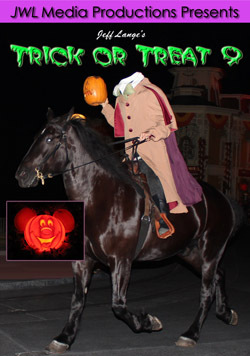 Check out this clip for a few of the bits that were removed including Devilish Mary!